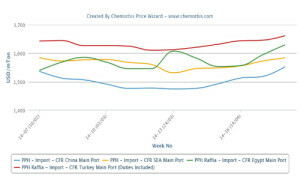 In the Middle East and Africa, players comment that they expect firmer prices for both PP and PE for April from the Middle Eastern producers, according to ChemOrbis. Players in these markets mostly form their anticipations based on the regional producers’ limited supplies. According to a Saudi Arabian trader, three Saudi Arabian producers were conducting PP maintenance shutdowns, which resulted in tight supplies. “These producers’ scheduled shutdowns have come to an end but it is still too early for supplies to get comfortable. Meanwhile, given better netbacks in Asia and Europe, Middle Eastern producers prefer to give larger quotas to those regions. This situation has caused overall availability to be even more limited in Middle Eastern and African markets,” he further added. A Lebanese converter also noted that a major Saudi Arabian producer has been adamant on their offer levels throughout March and they have refused to give discounts. “At the moment, demand is very good, but given tight supplies not many transactions can be materialized,” he added. A distributor operating in the United Arab Emirates noted that suppliers are offering in small quantities. “Overall demand is performing well but it is mostly due to the fact that buyers are rushing to secure some cargoes amidst tight availability and increasing prices,” he commented. Players in African markets also underline that supplies are tight from the Middle Eastern suppliers. A film products converter operating in Kenya reported that a major Saudi Arabian producer was very firm on their offer levels for March. “They have very tight supplies and they could only give us one container of each product we ordered. We see good demand for our end products and when considering the short supplies and the fact that the Saudi producer has only delivered 10% of their normal quota amount to Kenya, we believe that new April offers will come with increases,” he remarked. Meanwhile, another converter operating in Kenya noted that they managed to close their March PE deals with a major Saudi producer with discounts of $10/ton and PP deals with $30/ton drops. However, the Saudi producer had initially come with around $70/ton increases so, despite the discounts, March PE deals were still $60/ton above the February levels while PP deals were still $40/ton firmer from February. “Import cargoes are limited and this situation affects the locally held availability, too. We have been enduring delayed shipments from our Middle Eastern suppliers. Apart from this, we also face clearance problems which create clogging at ports and lead to pricec hikes on the locally held cargoes because of limited supplies. Unless materials are cleared from the ports and more supplies become available, prices won’t see any stabilization,” he said. 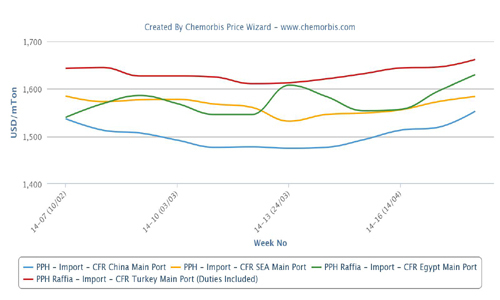 Whilst April expectancies centre on a firm note in the Middle East and Africa, players operating in the Turkish market have already started to receive new April PE offers with increases from March levels, according to ChemOrbis.